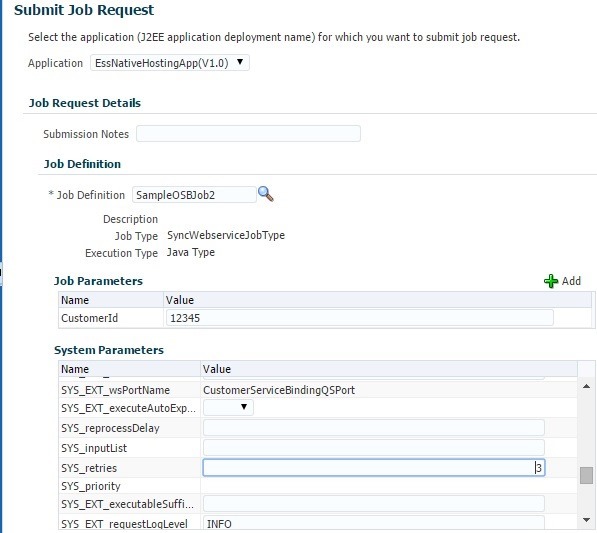 ESS provides the retry functionality through System Parameter SYS_retries and retry happens when a system error occurs during processing of ESS job request. By default, the value is 0 which means no retries will be performed. We can set the value or override this property while submitting the request as shown below or can add this parameter at design time in JDeveloper. Click OK and you can observe this in Parameters section as shown below. You can observe the number of retries performed in Request Search page by navigating to ESSAPP –> Job Requests –> Search Job Requests as shown below.